This mid grade cleaner is ideal for general "All Purpose" cleaning in less harsh environments, and perfect for daily maintenance programs for homes and businesses. Our products may be used in operations that are certified organic under the USDA National Organic Program. The greatly decreased hydrogen ion concentration (high pH) and balanced ORP (oxidation/reduction potential – measured in milli-volts) of The Clean-N-Green Answer® provides the necessary molecular energy for the maximum emulsifying and chelating action that is required to remove the oils, greases, protein, other substrate and invisible substances to which dirt, bacteria, fungus and algae adhere, and to remove carbon deposits and breaks down calcium and other scaling substances. This multi-surface product gives you an uncompromising clean while keeping our commitment to environmental responsibility. This is formulated using electrolyzed oxidizing water and a unique blend of agents to produce molecular action. The unique molecular action removes soils by eliminating the static electric attraction between the soil and surface being cleaned. As soils are removed, they are broken down and isolated into smaller segments, which are then unable to re-adhere to the surface and thus, easily rinsed away. Removing these substances produces a less favorable environment for any potentially pathogenic organism to thrive. 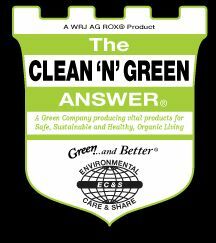 The Clean 'N' Green Answer® removes bacteria, fungi, mildew and mold by removing the dirt, fat, grease, oil, and protein substrates to which they adhere. Apply directly to surface being cleaned. Allow adequate dwell time for penetration. Scrub with sponge, cloth or brush. Wipe or rinse area with water to provide clean and residue-free surface. 2-2.5 gallon containers per carton. 36 cartons (180 gallons) per pallet.